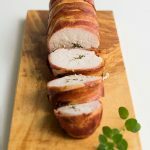 This bacon wrapped turkey roll (roulade) is extra juicy due to brining and is accompanied by a simple Mediterranean oregano sauce. Today’s dish is exactly that. Humble but delicious. Great in its simplicity. This recipe has an optional step that’s called brining. It’s not difficult, but you have to plan ahead since it requires bathing your bird in a salt solution from the previous night. 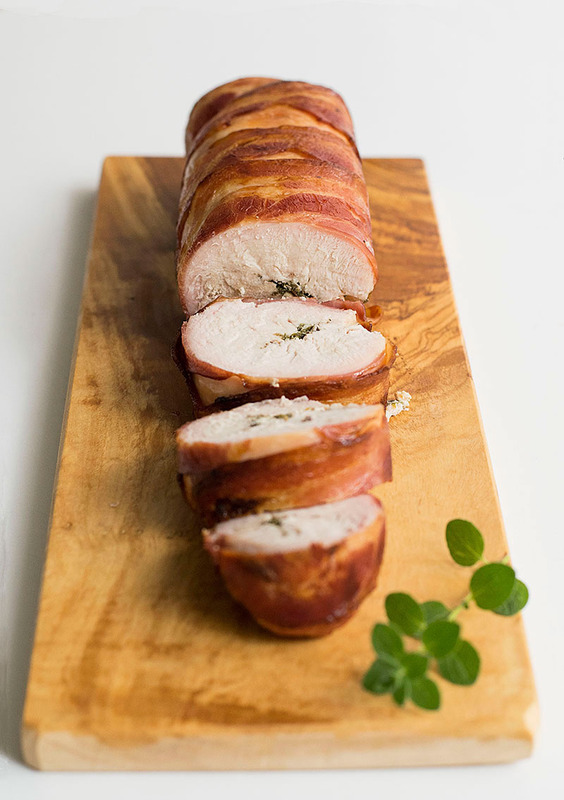 I’ve made this bacon wrapped turkey roll several times, with or without the brining step – I get bored sometimes, show some understanding here… Either way this dish is delicious, but with brining it gets a little moister. Because brining results in locking in extra moisture, it will help in case you overbake the roll. To avoid overbaking, the use of an oven thermometer is recommended. 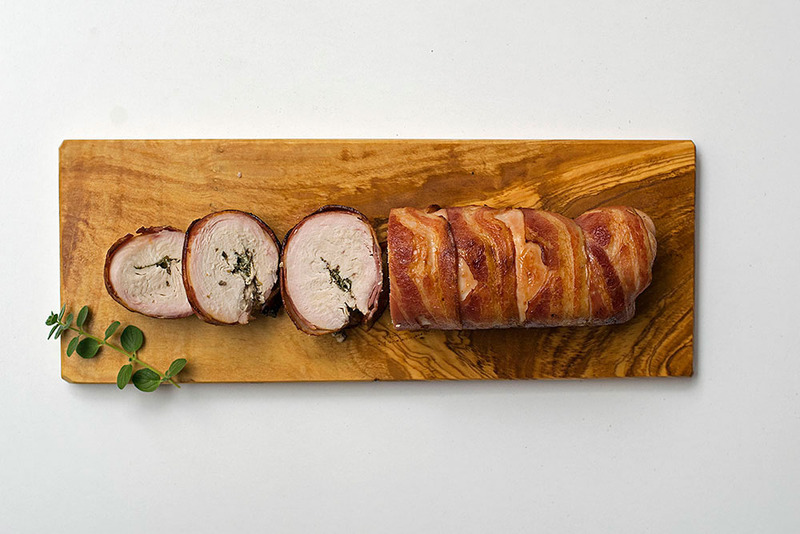 For more details about this brining method you can visit chefsteps.com. The Mediterranean oregano sauce. Olive oil, lemon and oregano is, as you may know, a classic Mediterranean combination – by the way, this mediterranean potato salad is drizzled with an olive oil and lemon dressing that takes it to a whole new level. This sauce is sometimes used as a marinade for meats before grilling and other times as a dressing for salads or meat and fish dishes to freshen them up. Use fresh oregano if you can, it makes a difference! OK, I’m not suggesting storming out to the countryside searching for spots where wild oregano grows. But buying a little pot from a flower market is a very cheap and easy solution. Keeping it somewhere sunny will ensure that you’ll have some fresh sprigs in hand whenever you need them. Don’t stress too much about rolling! Ask your butcher to cut the meat in a rectangular shape. Make sure that all of it is about the same thickness. If you have some areas more thick than others, pound them with a rolling pin or a heavy object to flatten them out. And even if you don’t roll it perfectly the first time, it will still taste awesome! If you brine the meat, DON’T use any more salt. Serve with french fries, mashed potatoes, my mediterranean potato salad or some fluffy rice. Some roasted vegetables with the same dressing wouldn’t be bad either! From the previous night: Heat half a gallon water with sugar and salt until dissolved. Add rest of the water and when cooled place in a container with meat and refrigerate overnight or for 8-12 hours. Take the meat out of the marinade, drain and pat dry. Place the turkey breast between 2 sheets of plastic wrap and pound lightly with a meat mallet to an even thickness of about 3/4-inch. Cut a piece of baking paper about 2 feet long (60 centimeters) and position bacon strips on one end with a little overlapping. 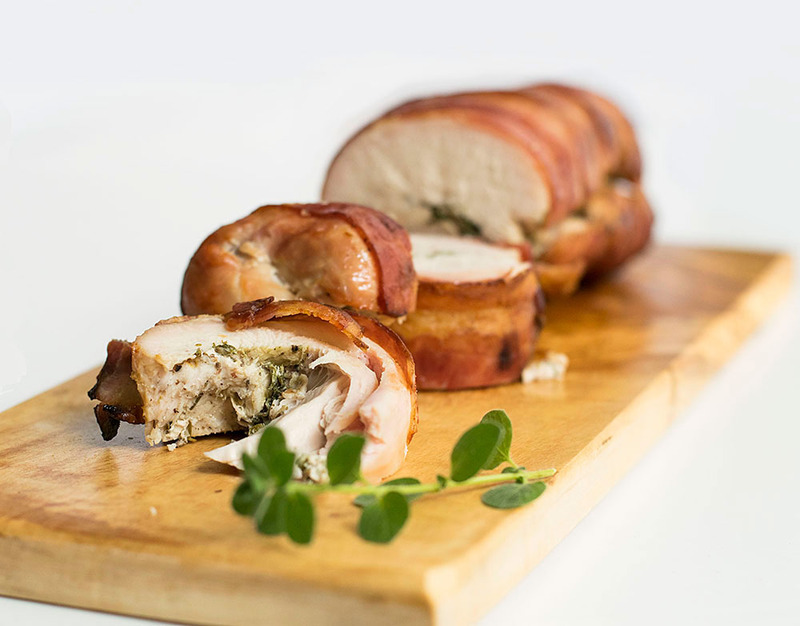 Place breast on top of bacon, sprinkle with oregano, pepper and olive oil. If you haven’t brined the meat add salt, about one teaspoon fine sea salt. 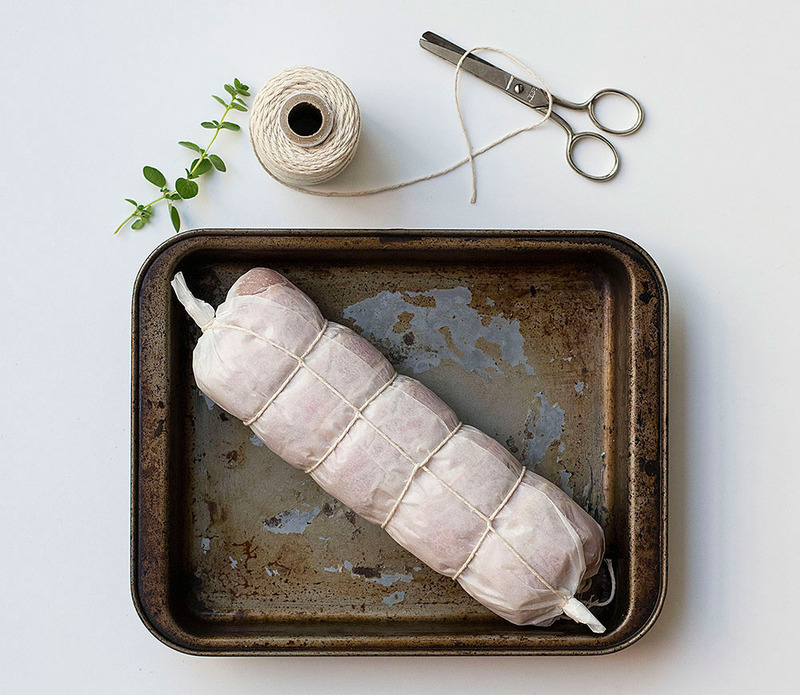 With the help of the baking paper roll like a candy and tie with twine. Bake in the middle of the oven for 50 to 75 minutes. (for every pound / 500 grams estimate 25 minutes of baking time). Minutes before end, cut open the baking paper and broil on the top rack of the oven turning half way for even caramelization of the bacon. At the end of the cooking time an instant-read thermometer inserted in the middle should read 150 degrees F / 65 degrees Celsius. In a shaker, shake together all the ingredients for the dressing. Cut the roll into slices and serve with the dressing, some vegetables and rice or a potato salad.